Every homeowner has repair projects and upgrades that they just never get around to completing (or even starting). But once you decide to sell your home you will likely have to address certain issues as they could impact your ability to interest buyers. You dont necessarily have to fix every scratched baseboard or replace outdated lighting fixtures, but there are some areas that youll want to focus on in order to ensure that your house gets interest right off the bat. Here are a few home repairs that you really cant ignore if you want to sell your property post haste. Chipped tile, pet-stained carpets, scratched woodwork, scuffed walls, and a laundry list of other cosmetic eyesores will quickly turn a sale situation into a nightmare scenario for new homeowners. While you just see your lived-in house, they see a money-pit of repairs that theyll take on if they buy. The trick for you is to make the property look as new and fresh as possible while spending the least amount of money (after all, you wont get to enjoy the upgrades and you almost certainly wont recoup your expenses on cosmetic repairs). So an allover cleaning is in order and you may want to paint and throw down new carpeting, as well. This will not only make your space more appealing, but you could avoid the paint and flooring deductions that many buyers seek. Dripping faucets and water-stained ceilings are a sure sign that there are leaks in your home, and most buyers will turn tail and flee at the first sign of plumbing issues. Considering how costly such repairs can be, they are probably smart to do so. As the current homeowner, its in your best interest to nip these issues in the bud. While you can probably fix a leaky faucet easily enough with a new rubber gasket and some Teflon® thread seal tape, the water spots might prove more problematic for the laymen. Since youll probably want to replace the drywall in any case, you might as well spring for a plumber to come out and assess the source of the leak. Want to save some money on the service call? Remove the drywall yourself; this is also a chance to see the extent of the damage first hand. You may have to pay a bit to fix the actual plumbing, but its better than having the new owners sue you down the line, and you can disclose the work you had done to stave off such legal issues. Still want to save money? Home improvement stores will cut and thread galvanized pipe for you if thats what you have and you will just need a pipe wrench. Got PVC or PEX? It will be even easier to repair. Whether youre facing damage to the roof or youve simply nailed up a lot of artwork while in residence at your current home, you should never display a house full of holes. These problems are fairly easy to repair in most cases. So why wouldnt you? Leaving nail holes in the wall is merely annoying and rude. But holes in the roof could put the brakes on a prospective sale. The long and short of it is that you just have no excuse for not making these repairs. Replacing individual shingles is not such a huge undertaking and a handyman can easily make the fix but you should still get a professional roofer to perform an inspection so potential problems will not come back to haunt you. Nail holes in your walls are even easier to fix. I recommend using white-colored DAP® Tub and Tile caulk. A little squeeze per hole followed by a finger-smoothing will do the trick. There are all kinds of things that can give your home a bad odor, and this will turn off prospective buyers more surely than any cosmetic flaws. So send smokers outside, entrust your pets to a friend for a few weeks, and get some new trash cans (with scented liners). Then do a thorough cleaning, remove any items that hold lingering odors (plush furnishings, carpeting, etc. ), and place a few potted plants and fresh flowers throughout the house to clear the air and make for a more inviting atmosphere. If anyone has been smoking in the home for any length of time, it may be necessary to wipe down your walls with a product like TSP (Tri Sodium Phosphate). Just be sure to use gloves. Before you put up lawn or window signs to advertise that your house is for sale, you need to make sure that these areas are up to snuff, providing a good first impression for prospective buyers. 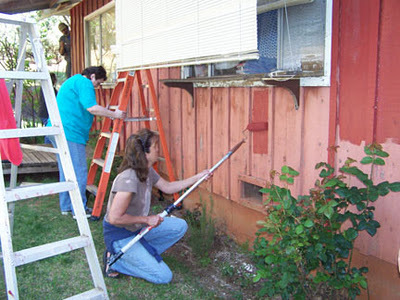 A fresh coat of paint on the front of your house (if not all around) couldnt hurt, and you should think about replacing any screens or storm shutters that are in disrepair. Window screens are easy to replace using inexpensive screen material, flexible spline (check the size) and screen roller tool. Clean up the aluminum frames with steel wool if needed. Youll also want to cut back overgrown plants and shrubs, make sure the lawn is watered, fill any cracks in the driveway, walkway, or front steps, and perhaps add a couple of planters with colorful blooms to add instant aesthetic appeal. Its important to get off on the right foot with buyers if you want them to seriously consider your property. Do you have any home sales or marketing tips to share with our readers? Enter them in the comment section below.